Batteries Plus, L.L.C. offers individual and multiple unit franchises for the operation of Batteries Plus® stores ("Stores"), selling batteries and battery-related items for the retail consumer and commercial accounts. fee for the three Stores, js S70.000. If vou acquire the rights Multiple Unit Franchise Agreement, the tota] ipjtial franchise fee for the forec Stores is 70.000. The estimated initial investment for a single unit Store ranges from SI79.300176.485 to $315.300.327.485. These figures are approximate and vary from location to location and do not include real estate (land and building) costs. 1. THE FRANCHISE AGREEMENT AND MULTIPLE UNIT FRANCHISE AGREEMENT REQUIRE THAT ALL DISPUTES BE SUBJECT TO NON-BINDING MEDIATION IN HARTLAND, WISCONSIN, THEN BINDING ARBITRATION IN MILWAUKEE, WISCONSIN. OUT OF STATE ARBITRATION MAY FORCE YOU TO ACCEPT A LESS FAVORABLE SETTLEMENT. IT MAY ALSO COST YOU MORE TO MEDIATE OR ARBITRATE WITH US IN WISCONSIN THAN IN YOUR HOME STATE. 2. EXCEPT FOR FRANCHISES SUBJECT TO ILLINOIS OR NORTH DAKOTA LAW, THE FRANCHISE AGREEMENT AND MULTIPLE UNIT FRANCHISE AGREEMENT REQUIRE THAT ANY DISPUTE NOT SUBJECT TO ARBITRATION WILL BE LITIGATED IN THE STATE OR FEDERALS COURTS IN WAUKESHA COUNTY WISCONSIN. OUT OF STATE LITIGATION MAY FORCE YOU TO EXCEPT A LESS FAVORABLE SETTLEMENT. IT MAY ALSO COST MORE TO LITIGATE IN WISCONSIN THAN IN YOUR HOME STATE. 3. THE MULTIPLE UNIT FRANCHISE AGREEMENT CONTAINS CERTAIN MINIMUM DEVELOPMENT REQUIREMENTS. EF YOU DO NOT ATTAIN OR MAINTAIN THESE REQUIREMENTS, THE FRANCHISOR MAY TERMINATE THAT AGREEMENT. 4. YOU WILL LOSE YOUR PROTECTED TERRITORY IF YOU FAIL TO MAINTAIN MINIMUM NET REVENUE REQUIREMENTS FOR TWO CONSECUTIVE YEARS AS FURTHER DESCRIBED IN ITEM 12. Information about comparisons of franchisors is available. Call the State Administrators listed in Exhibit G or your public library for sources of information. The Effective Date of this Offering Circular is printed on page (vi) of this Offering Circular. fee for the three Stores \s S70.000. If vou acquire the rights to build and operate three fttores upder a Multiple Unit Franchise Agreement. t\\e total "7'tJal franchise fee for the three Stores is 70.000. The estimated initial investment for a single unit Store ranges from $179.300176.485 to $31x300.327.485. These figures are approximate and vary from location to location and do not include real estate (land and building) costs. 2. THE FRANCHISE AGREEMENT AND MULTIPLE UNIT FRANCHISE AGREEMENT REQUIRE THAT ANY DISPUTE NOT SUBJECT TO ARBITRATION WILL BE LITIGATED IN THE STATE OR FEDERALS COURTS IN WAUKESHA COUNTY WISCONSIN. OUT OF STATE LITIGATION MAY FORCE YOU TO EXCEPT A LESS FAVORABLE SETTLEMENT. IT MAY ALSO COST MORE TO LITIGATE IN WISCONSIN THAN IN YOUR HOME STATE. THIS FACTOR SHOULD BE TAKEN INTO ACCOUNT IN DETERMINING WHETHER OR NOT TO PURCHASE THIS FRANCHISE. 3. THE MULTIPLE UNIT FRANCHISE AGREEMENT CONTAINS CERTAIN MINIMUM DEVELOPMENT REQUIREMENTS. IF YOU DO NOT ATTAIN/MAINTAIN THESE REQUIREMENTS, THE FRANCHISOR MAY TERMINATE THAT AGREEMENT. Registration of this franchise with the state does not mean that this state recommends or it has verified the information in this Offering Circular. If you learn that anything in this Offering Circular is untrue, contact the Federal Trade Commission and the state authority listed in Exhibit G.
THE FRANCHISOR MAY, IF IT CHOOSES, NEGOTIATE WITH YOU ABOUT ITEMS COVERED IN THE PROSPECTUS, PROVIDED THE FRANCHISOR CANNOT USE THE NEGOTIATING PROCESS TO REQUIRE A PROSPECTIVE FRANCHISEE TO ACCEPT TERMS WHICH ARE LESS FAVORABLE THAN THOSE STATED IN THIS PROSPECTUS. THIS NEW YORK COVER PAGE APPLIES ONLY TO FRANCHISEES WHO ARE RESIDENTS OF NEW YORK OR LOCATE THEIR FRANCHISE IN NEW YORK. EFFECTIVE DATE: See Effective Date on Page (vi) Above. To simplify the language in this Offering Circular, "we" and "Batteries1' means Batteries Plus, L.L.C, the franchisor. "You" means the person who buys the franchise. If a corporation, partnership or limited liability company buys a franchise, "you" also may refer to the shareholders of the corporation, partners of the partnership or members of the limited liability company. Batteries was formed as a result of a conversion of Batteries Plus, Limited Partnership, a Wisconsin limited partnership ("BP Limited Partnership"), in August 1996. BP Limited Partnership, our predecessor, was formed on September 11, 1991 (it is no longer active). Batteries previously operated as a division of the limited partner, Packerland Automotive Group, Inc., and opened its first retail Batteries Plus® store on November 17, 1988. We operate retail battery stores under the name "Batteries Plus" ("Stores") and sell franchises for the operation of Batteries Plus® Stores. We operate 14 Stores that are substantially similar to the franchised Stores. BP Limited Partnership offered franchises for Stores from April 1992 to August 1996. We have offered franchises for Batteries Plus® Stores since August 1996. Neither Batteries, nor our affiliate or predecessor, has ever offered franchises for any other type of business. A Store will have an inventory of between 800 and 1,100 different types of batteries and related products available for the customer for everything from calculators to aircraft. Ascent Battery Supply, L.L.C, a Wisconsin limited liability company ("Ascent") is our affiliate and wholly-owned subsidiary that acquires batteries and other related products from suppliers for redistribution to Batteries Plus® franchisees through designated or approved third-party suppliers. Ascent was formed under the name "Tarron, L.L.C." on January 21, 1999. 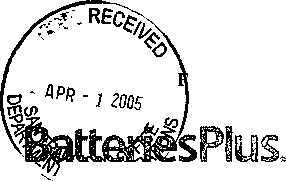 On January 1, 2003, the entity changed its name to "Ascent Battery Supply, L.L.C." Ascent's principal business address is 925 Walnut Ridge Drive, Suite 100, Hartland, WI 53029 (see Item 8 for further discussion). Your competition will include other retailers of automotive parts, accessories and supplies, including auto supply stores, department stores, discount stores and general merchandise stores and other franchises offering different lines of batteries. The concept of having a one-stop battery store offering the consumer a complete line of batteries had not been previously developed until we started our concept. If you are a Multiple Unit Franchisee, you will receive the exclusive right to open a certain number of Stores over a defined period of time in a defined area, as we determine, on the basis of the market potential and the size of the designated area. The term of your Multiple Unit Franchise Agreement generally will not be longer than 3 years and will require you to purchase or lease the approved location of the first store within 6 months from the date of your Multiple Unit Franchise Agreement and open your first Store within 9 months from the date of your Multiple Unit Franchise Agreement and open your second Store within 24 months from the date of your Multiple Unit Franchise Agreement. If you are an individual unit franchisee, you will receive the right to own and operate a Store at a location we approve, offering the products and services we approve and using our formats, designs, methods, specifications, standards, operating and marketing procedures and the "Licensed Marks" (as defined in Item 13) including "Batteries Plus" (collectively, the "System"). You should be aware of zoning ordinances and regulations in your proposed territory. In certain areas of the country and affected municipalities, you may be prohibited from installing automobile batteries outside your Store. Many states have enacted statutes that regulate the sale and disposal of batteries sold at your Store. All states prohibit retailers from discarding nickel cadmium batteries, as they must be recycled. You should check your state statutes to determine the measures you must take to comply with legislation in your state. In addition, several states impose environmental taxes on nickel cadmium batteries. We fully expect that regulations eventually will be adopted throughout all states requiring the recycling of nickel cadmium batteries. We are a sublicensee of the National NiCad recycling program. Spent batteries are sent to IMETCO (a recycling company funded by various battery manufacturers) for recycling. acid ("SLA") batteries. In addition, several states have enacted laws requiring similar information pertaining to Ni-Cad batteries. The laws covering Ni-Cad batteries specifically target dry cell nickel-cadmium batteries. SLI spent batteries are classified as a hazardous waste and regulated by the Environmental Protection Agency. The Environmental Protection Agency adopted the Universal Waste Rule (the "Rule") to encourage recycling and proper disposal of certain common hazardous waste and to reduce the regulatory burden on businesses that generate these wastes. Universal wastes include batteries which are generated by small and large businesses. Our recycling policies comply with the Rule and with the Mercury-containing and Rechargeable Battery Act ("Battery Act") adopted in May 1996. The policies are disclosed in our Operations Manual. Our policies address proper handling, storage and disposal of universal waste batteries. You may only send waste batteries to a universal waste handler, or a destination facility or a foreign destination. Our Operations Manual lists the potential battery consolidators and disposal facilities. You also should check your state and local authorities for a listing of battery consolidators and disposal facilities. The Battery Act pre-empts state law by automatically subjecting certain types of batteries to the Rule. Each Store must comply with these laws, and we urge you to become familiar with these specific laws and regulations governing the operation of a Store in your state. You also should check your state and local authorities to determine if there are additional requirements. Mr. Reynolds has been Chief Executive Officer of Batteries since July 2001. From February 2000 to June 2001, he was Chief Operating Officer for Batteries. Mr. Reynolds also has been a member of the Operating Committee for Batteries since February 2000.From Juno 1994 to February 2000, Mr. Reynolds was Vice President and General Manager of the Automotive Battery Division for GNB Technologies in tho United States, Australia, New Zealand and the-Chief Operating Officer: Thomas E. Knab. Jr.
Mr. Knab has been Chief Operating Officer of Batteries since April 2002. From June 1991 to April 2002, he held various positions with BankOne Corporation in Appleton, Wisconsin, including that of Senior Vice President, Group Executive and Market President, from January 1999 to April 2002.
company, from 1995 to April 2002, including that of Interim Divisional President from January 2001 to April 2002. Mrs. Grota has held various positions at Batteries since August 198S, including that of Vice President of Franchise Administration from July 1996 to May 1999 and from January 2000 to September 2001. and Vice President of Franchise Administration and Development since September 2001. Mr. Hessenthaler has been Vice President of Marketing and Merchandising of Batteries since November 2002. From January 2000 to October 2002, he was Director of Marketing for Kasch Merchandising, Inc., a Mequon, Wisconsin based wholesale distributor of consumer products. From August 1996 to July 1999, Mr. Hessenthaler was Vice President of Marketing for Northland Cranberries, hie, a Wisconsin Rapids, Wisconsin based grower, processor and marketer of cranberries. Mr. Lehman has held various positions at Batteries since January 2000. including that of Chief Information Officer since March 2004. Mr. Lauterbach has been Vice President of Corporate Store Performance of Batteries since July 2002. From November 1993 to July 2002, he was District Manager for OfficeMax, Inc. in Brookfield, Wisconsin. Mr. FischeiJankowski has been Director of Growth and.Store Development Executive of Batteries since September ^004. From June 2003. From September 2003 to March 2003, he was Regional Sales Manager for Folding Guard Company in Chicago, Illinois.Mr. Fischer was employed in automobile sales with Concours Motors in Milwaukee, Wisconsin from March 2002 to Soptombor 2002.From January 1996 to January 2002, he was Regional Sales Vice President/Glnhal Accounts for Rite Hite Coiporation2f)03 to September 2004, he was a Fjeld Consultant for Batteries. From November 1998 to Mav 2003. Mr. Jankowski was Senior igcr/Assistant Vice President for Perot Systems/CSRfi in Milwaukee, Wisconsin. Mr. Tremelling has held various positions at Batteries since September 1994, including that of Franchise Development ManagorExecutive since April 2003.November 2004. Mr. Hein has been Secretary/Treasurer of Batteries and a member of our Operating Committee since August 1996. He also has been Secretary, Treasurer and Director of BP Holdings, Inc. (f/k/a Packerland Automotive, Inc.) since August 1996. Mr. Epstein has been a member of the Operating Committee of Batteries since August 1996. He also has been an attorney with the firm of Jackawav. Tyerman. Werthheimer. Austen. Mandelhaum & Mops. P.C. (f/k/a Armstrong. Hirsch, Jackoway, Tyerman & Wertheimer, P.C.) in Los Angeles, California since May 1990. Mr. Rolfs has been a member of the Operating Committee of Batteries since August 1996 and has been partner of Crimson Capital Company, located in Milwaukee, Wisconsin, since January 1993. Mr. Rezetko has been Chairman Emeritus of Batteries since July 2001 and a member of our Operating Committee since August 1996. He was Primary Manger and Chief Executive Officer of Batteries from August 1996 to June 2001. No litigation is required to be disclosed in this Offering Circular regarding us, our personnel disclosed in Item 2 or any predecessor or affiliate of ours. Any litigation required to be disclosed in this Offering Circular regarding any franchise broker is disclosed in Exhibit F - the Franchise Broker Exhibit. vou participate in thJS-piQgram in orde Initial Franchise Fee, the Multiple Unit Territory Fees are not circumstances. In addition to the initial franchise fee, you will pay us a computer access and "POS System" development fee of $Sr2958.990 related to your use of the_Counterpoint<R) Proprietary Software and a computer access fee of $1.495 related to your use of the Pro Source Proprietary Software. (See "Point-of-Sale System" under Items 7 and 11 for further information.) You must pay this feeihese fees on or before the date you open your Store for business. ThisThese computer access and POS System development -feeisfees are not refundable under any circumstances. Payable monthly, funds transfer on or before the 10th day of the month following month in which sales were made. Minimum amount must be spent during each calendar year (except for 90-day requirement for gyandStore opening campaign). Payable when you request an extension to the Development Schedule under the Multiple Unit Franchise Agreement. Payable when you request an extension of time in which to open the Store. Payable before we review the proposed new Store site. Before renewal of Franchise Agreement. Cost of audit plus VA% interest per month from due date. Payable only if audit shows an understatement of at least 2% of Net Revenues for any month. Eriigrarn Fees- "\ ^■,.' ." paries, rnav include administrative fees or product surcharge oh certain sales, ctepejKhn? on structure of . program.-'. ';, -' ;." '-"
(1) Except where otherwise noted, all fees are payable to Batteries and are non-refundable. (2) "Net Revenues" generally means the aggregate amount of all sales of goods and services (including service charges in lieu of gratuity), whether for cash, on credit or otherwise, made or provided in connection with the Store, but excluding taxes paid or accrued by you. (3) If you do not spend at least 4% of the Store's Net Revenues during the calendar year for cooperative or local advertising wl^ch we have approved jn advance,, you will deposit with us the difference between what you should have spent for advertising during the calendar year and what you actually spent for advertising during the calendar year. We will deposit these monies in the NMF Fund (see Item 11 for discussion of NMF Fund). (4) This fee is credited to the initial franchise fee of the applicable Store if we grant ap extension of time and vou open that Store by the extension deadline. (5) This fee is credited to you ifjye.grant an extension of time and you open the Store by the extension deadline. This fee (and the extension request) applies only if you have not signed a Multiple Unit Franchise Agreement. (6) You pay this fee when the Franchise Agreement or a substantial portion of the assets of the Store or any controlling interest in you is transferred. No transfer fee is due if the transfer is to an immediate family member. (1) The typical size of a Batteries Plus® Store ranges from 1,200 to 1,800 square feet. For several items discussed below, your cost will increase as the number of square feet increases. The size of your Store is principally determined by requirements or restrictions that your landlord and appropriate municipality or zoning boards may impose, and availability and cost of leasable space. This Table reflects your estimated initial investment for a single Store operated under a Franchise Agreement. This information assumes that you will lease the premises for your Store. (3) The initial franchise leolm'tial Franchise Fee paid is paid to us and is more fully described in Item 5. We also offer a discounted Initial Franchise Fee for franchisees committing to opep three Stores, as more fully described in Item 5.